Working in an office also means tackling all the mess that comes along with it. It’s ok to take out the bins, however when excess things like old furniture start piling up you know it is a matter of time before it starts to irritate you. You cannot always ask your staff to help you clear things either, so the best solution is to hire a specialised Tooting rubbish removal company. Go Rubbish Go. can sort out all your furniture clearance and waste collection in SW17. You may have a rubbish clearance in Tooting, SW17 done often, why not extend the same courtesy to your place of work and allow us to help you when you need it most! For more information, call us now on 020 8610 9182 and talk to an expert of our team. We have a vast range of clearance services. 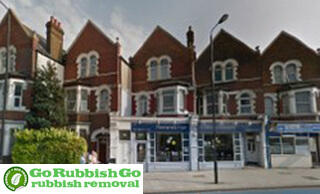 Based in SW17, we are local to you and can come out to you for rubbish removal at very short notice. So you have important clients that are coming for a big deal from overseas and you realise that you have old chairs as well as other office junk that all over the place, and you’re not really sure what to do. You can’t tear your staff away from their work to help you, so you think of the next best thing, which is us! 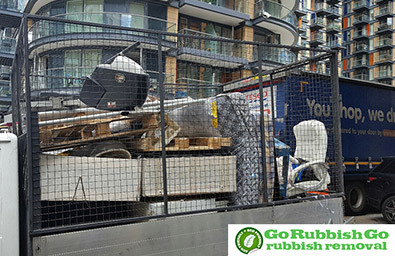 Here at Go Rubbish Go., we can help you with all your SW17 rubbish disposal and office clearance needs, without you having to lift a finger. Our well trained and licensed experts are on call 24/7 and work late hours to ensure everything goes swimmingly for you. I’m very grateful for everything you did for me! There’s no way I would have been able to manage clearing out my garage so fast without your incredible team and the great rubbish disposal services you offer in Tooting, SW17. Thanks you so much! Expert Rubbish Clearance in Tooting for Best Results! It is very challenging and dangerous to do rubbish removal in your office in SW18 especially with things like printers that can leak and cause people in the immediate environment to be sick. Based locally in Tooting, our rubbish removal teams can come out to you at a last-minute notice to help you clear out your office and prepare you for your big day ahead with your clients. For more information on how to book our waste removal SW17 services, call us today on 020 8610 9182. Our advisors will help you book an appointment for office clearance with us at a time and date that suit you best. We look forward to helping you with your clearance! Knowing how to dispose of certain materials and what to put where isn’t as straightforward as it seems. So calling an established, well reputed waste clearance Tooting, SW17 company can certainly help to take a load off your shoulders. Whether you have garden waste or large bulky furniture items that you need to get rid of, we are the company for you. Providing quality waste disposal in SW17, Tooting, we are the best choice for many household and business owners! 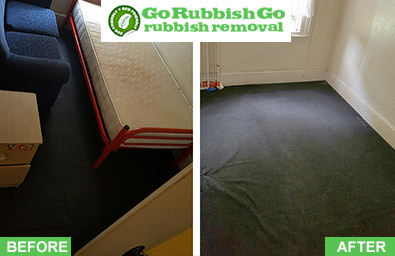 All you need to do is give us a call on 020 8610 9182 and let us take care of the rest. Tooting, based in South London, is situated in the London Borough of Wandsworth and comes under the postcodes of SW17 and SW18. It is known to be South Asian dominated and it is very densely populated. Nearby areas include Streatham, Balham, Clapham as well as Brixton. Tooting is served by two underground stations – Tooting Broadway and Tooting Bec, that are both on the Northern line en route to Morden. The district is often known for its green areas, Tooting Green and Tooting Common which are largely occupied by parks and open green spaces. It also has a number of markets that enable people to shop at affordable rates. These markets are often open during the weekend and are most animated then, however they are open all week long except on bank holidays. Tooting is also served well by a lot of buses as well as the Tooting railway station.